← Week 26 – Question of the Week: How long do we have to prepare? If you don’t have a peak flow meter, get one. Perhaps neither you nor your family suffer from asthma or COPD, but no doubt someone you know does. If you are going to be a medical provider for anyone beyond yourself, you need to understand something about respiratory difficulties. Asthma and COPD (chronic obstructive pulmonary disease) are the classic causes of narrowed airways, though other possibilities include acute allergy, inhaled irritants such as fumes or smoke, anaphylaxis, bronchitis, influenza, and pneumonia. A peak flow meter measures the peak expiratory flow, that is, the fastest rate at which a patient can expel air from their lungs. This occurs in the first fraction of a second upon exhalation. When the bronchial tubes are restricted or obstructed, this rate diminishes. 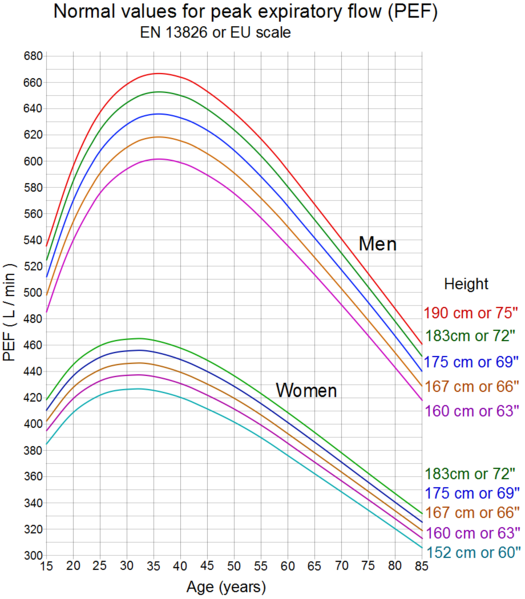 The peak flow rate depends on gender, age, and body size as well. Download the graph attached HERE for your records, so you’ll know what is and isn’t normal for patients of various ages and sizes. The graph is in the public domain and may be copied for your use as needed. Children and certain impaired patients have a lower peak flow than typical adults. I suggest also purchasing a low-range peak flow meter for this group. Some peak flow meters feature disposable mouthpieces, though the typical plastic meter can be easily cleansed with alcohol or other disinfectant. Some patients, including myself, can notice a decrease of as little as 10% in their peak flow rates. Others will not notice a change until the rate has decreased 25% or more. This is sometimes due to lack of activity that challenges a patient’s respiratory reserve – if you’re just sitting around, you’re less likely to notice that you may be a bit short-winded. People with chronic problems, especially those with COPD who are always short of breath, sometimes are not aware of a problem until their rate is dangerously low – at perhaps 10-25% of their personal best (which is likely diminished to start with). When you acquire this handy tool, try it out on your family and friends so you get a sense of what is and isn’t normal. Don’t be surprised if you discover some of your subjects are not breathing as well as they suppose – asthma and COPD are both under-diagnosed in the general population. Proper technique is another concern; use of the peak flow meter does take a little practice. Be sure to read the directions that come with the meter. The most important factor is to exhale with the consonant “h” rather than with a “k” or “g” sound (as in the onset of a cough), which will give an artificially elevated result (better than it actually is). With a little practice anyone can master the use of a peak flow meter. 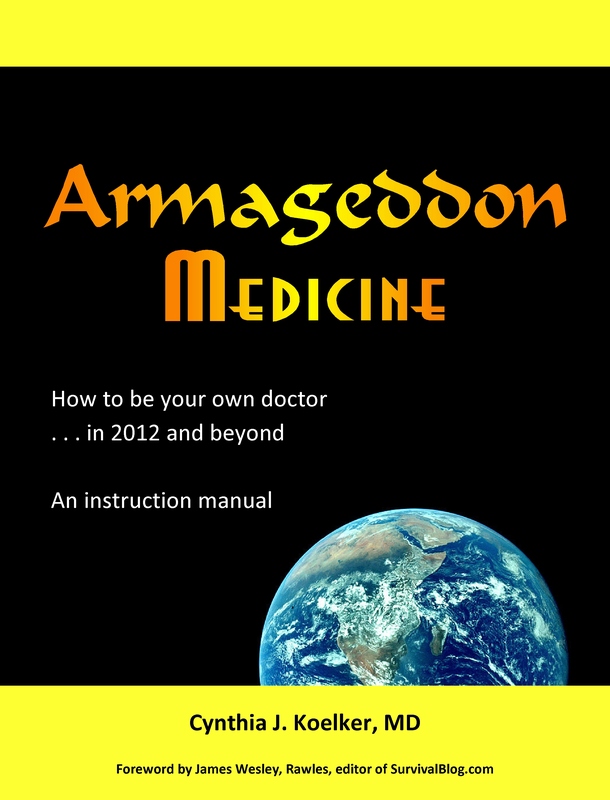 In my book, Armageddon Medicine, I include a section entitled “Toward Becoming a Healer,” which explains how to perform a medical history and physical. Understanding how to use and interpret a peak flow meter would be a great advantage both in this world and one without doctors handy. In a future post I will discuss how to use the peak flow meter diagnostically and therapeutically. This entry was posted in Acute diseases, Allergies, Armageddon Medicine, Asthma, Asthma/COPD, Bronchitis, Chronic bronchitis, Contributors, COPD, Cough, Emphysema, Influenza, Lung disease, Medical archives, Peak flow meter, Pneumonia, Shortness of breath, Slide show, Symptoms, Wheeze and tagged Asthma, Chronic obstructive pulmonary disease, Conditions and Diseases, Dyspnea, Exhalation, Health, Patient, Peak expiratory flow. Bookmark the permalink.